Foot binding was the Chinese custom of wrapping young girls’ feet painfully tight to prevent growth and maintain a small shoe size. Up until the early 20th century, it was a status symbol, as women who bound their feet could afford to not work in the fields. Binding started between the ages of four and nine, before the foot was fully developed, and consisted of squeezing curled under toes into the sole of the foot until the toes and arch broke. The thought of breaking my feet so I can wear a size four instead of a size eight makes me nauseas, however, for the first three years of my climbing career I forced my feet into climbing shoes that were two sizes too small. Why? Because tight shoes make you climb harder; or rather, that’s what I was told. In retrospect, this practice isn’t really that different from the Chinese tradition – just another culture’s example of the pressure and power of societal competition. When climbing first began, specialized equipment for the sport had yet to be developed, which meant most climbers wore large leather boots. As the sport progressed, so did the equipment used and the climbing shoe was born. Pierre Allain, an accomplished French alpinist and free climber, was one of the first to develop a “true” rock climbing shoe in the 1950’s. Known as PAs, they looked quite similar to today’s shoes; they were made of suede and canvas with a hard composite, rubber sole. In the 1960s, with the advancement of technical climbing, came the advancement in climbing shoes. Edmond Bourdonneau, who originally worked for Pierre Allain, designed a spinoff of the PAs – EBs. 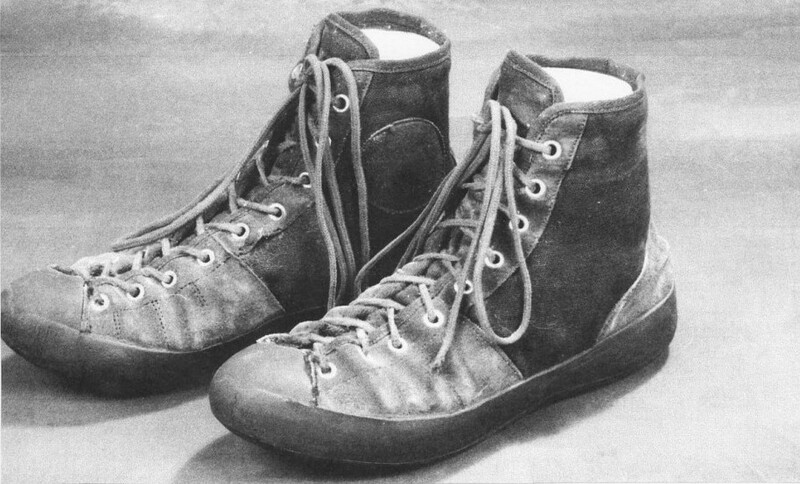 The EBs were fashioned with softer rubber soles, which provided better grip on rock, especially on tiny edges. From the 1960s through 1980, climbing stores almost exclusively sold the EB climbing shoes, however, in 1980, Bourdonneau changed how the rubber soles were produced to increase production rates, which resulted in the compromised fit and performance of the shoe. Although this opened the door of opportunity for competitors, it wasn’t until the Boreal Fires were available in 1982, that a design surpassed the previous EBs. 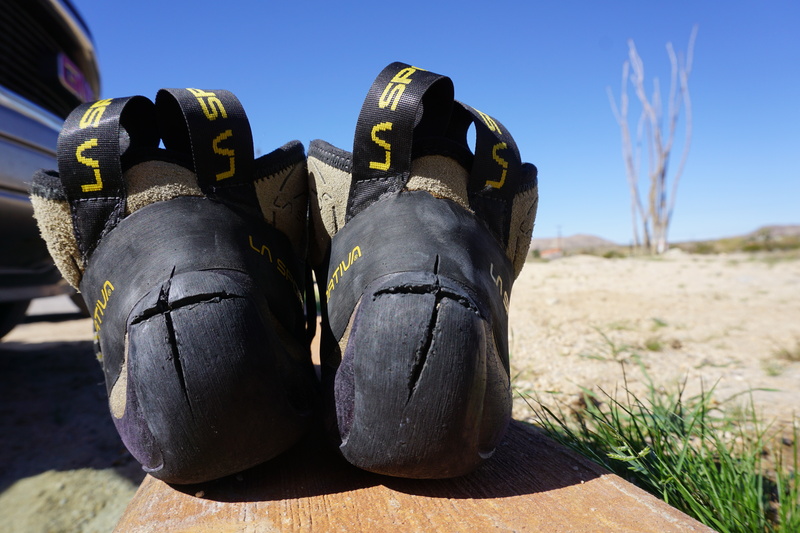 The Fires were a huge progression forward, as they were the first true “sticky rubber” climbing shoe on the market, which completely changed the game of slab climbing and has segued into modern day shoes. Seeded within this history is the misconception that climbing performance is directly correlated to how tight your shoes fit. While sizing down your shoes may have been the norm before many product options existed and fit was less precise, today’s world is filled with particularly designed shoes made for high-end performance. While snug shoes free of empty space are desired, this is too often mistaken as painfully tight or the smallest size you can bare squeezing your feet into. 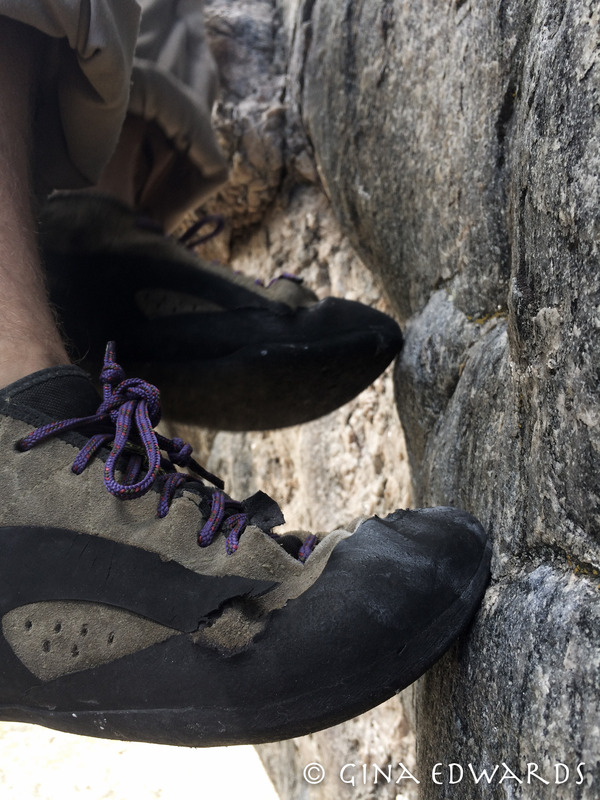 While the advanced and elite climber may notice a small difference in performance with a slightly smaller shoe, it will not magically turn a 5.10 climber into a 5.11 climber. In fact, at a certain point, it will have the opposite effect, not only diminishing your ability to edge because your toes are just too painful to bare weight, but also decreasing the amount of time you spend climbing because it just isn’t fun anymore. If you have to bail off a route because you can’t stand keeping your shoes on for a second longer, aren’t you defeating the original purpose of wearing those shoes? Many climbers are taught to bite their tongue and deal with pain, whether it is throbbing finger locks on a steep crack or days of back wrenching hauling on a big wall. We accept the suffering because it’s impermanent; we know it’s a fleeting moment, and when it does pass the moments we remember and the experiences we gain easily dwarf any past feelings of discomfort. However, when it comes to our feet, ignoring the pain today could leave you with a lifetime of problems tomorrow. Hallux valgus (big toe bends toward other toes), Mycosis (fungal infections), bunions, corns, and blood vessel compression are just a few of the problems that pop up with climbers. These conditions not only lead to chronic foot pain, but can also increase the chance of other injuries. Another condition far from uncommon within the climbing community is Haglund’s deformity. I personally have struggled with the painful inconvenience of Haglund’s Deformity (the giant bump on my heel), compelling me to remove my shoes at each belay station on multipitch routes. Although this condition is more prone to develop with specific foot types (high arched feet, tight Achilles tendon, walking on the outside of the heel), it stems from the back of rigid shoes creating too much pressure against the heel, which leads to painful bursitis (inflammation of the bursa, a fluid-filled sac between the tendon and bone). Over time, swelling leads to the thickening of tissue, which increases pressure in the heel further. To treat Haglund’s deformity, surgery is initiated to remove the heel bump, or patients are told to refrain from wearing closed back shoes to prevent irritation and pain. As a climber, unless barefoot climbing interests you, there’s really no way around wearing closed back shoes. Once you’ve gotten to the point of Haglund’s deformity, you are past the point of return. While wearing larger shoes will prevent any further conditions from developing, it will not decrease the size of your heel bump. I cut Xs in the back of my shoes to relieve pressure on my heel. This has made all the difference in my comfort, and allows me to wear my shoes comfortably all day long. How important is it that you’re still climbing in 5, 15, 25 years? If it’s important, you should take care of your feet and prevent disability by wearing the correct shoe size. In reality, your feet are just as important as your hands when it comes to rock climbing. Climbers go to extreme measures to keep their fingertips from wearing out, including wearing rubber gloves when washing their hair or putting on sunscreen (soft skin wears out faster), yet the same people will then bind their feet within the confines of small climbing shoes to the point of mutilation. Why is it our fingers receive more respect than our toes? When buying climbing shoes, it’s important to remember that everyone’s feet are different. You need to buy shoes that work best for your feet, not the shoes that your friend wears, the pair that’s on sale, or the pair that your favorite professional climber wears. We have a huge advantage today because there are so many different options out there to choose from and each is made to fit a little differently. If you spend the time up front trying on different brands and designs, you’re bound to find one that best suits your feet and your climbing style. Many thanks for your passionate and diligently researched article! You are a godsend! I suffer from a variety of foot disorders which are the cumulative result of five years of gnarly abuse from aggressive climbing shoe, a lifetime of wearing overly tight dress & casual shoes, + my genetic predisposition for connective tissue and joint dysfunction (resulting in misshapen feet). All that aside, I basically took the last 3 years off of climbing…I suffered a full tib-fib fracture from a bouldering fall (just missed the pad); I’ve climbed less than 20 times post-accident. Now plotting my return to my favorite sport/passion, I’ve discovered that my feet have grown substantially worse; the result of years of abuse and disregard. I’ve been relentlessly searching for a climbing shoe that can accommodate my needs without resulting in additional chronic pain and permanent damage. I’m getting closer to finding the right shoe and your advice has inspired me try professional shoe stretching as an additional strategy! That may just be the game changer I need! I’ve always heard military folks give me the advice that taking care of your feet is mission #1. Apparently they knew what they were talking about. Much love and many thanks for your article! Blessings to all of us out there with haggard dogs…time to show our puppies some much needed TLC. Flat feet with collapsed arches. Claw toes (2) beginning to form on right foot. Wide foot at widest point, narrow foot at narrowest point. Wide foot, yet low volume and skinny. Slight tendinitis and weakness of big toes. + obviously, the typical top-of-toe corns and “knobby” bones many climbers develop. NONETHELESS, I’M GRATEFUL FOR THE TWO FEET I HAVE!!! Now time to show them some love…let’s all do the same! Can’t wait to crush again! It’s about time someone else said this. I’ve been saying this since I started climbing in 1991 or so.